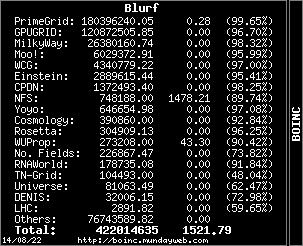 "Whenever I restart my Win7 box, Boinc always starts up and tells me the GPU is missing. I have to go to File>Exit, then start Boinc again, usually twice. It's a minor thing, but it's annoying." Ubuntu-supplied boinc) to get the GPU to show up. Message 1372999 - Posted: 29 May 2013, 7:54:16 UTC - in response to Message 1372905. I notice the PFB splitters are still extrememly limited in their output. Just a few shorties in the mix, and the ready-to-send buffer plummets, yet the splitters still only plod along at 30/s. Alright. Let's see what we can see. Everybody on-line? Looking good. Message 1373139 - Posted: 29 May 2013, 21:49:27 UTC - in response to Message 1373138. Application page lists version 7 executables. Would've been nice to have an official post on the Front Page or a News post by Eric or Matt about the change before it happened instead of all this "if it happens" stuff. Message 1373144 - Posted: 29 May 2013, 21:53:19 UTC - in response to Message 1373142. It will probably happen when the transition is finnished. Message 1373172 - Posted: 29 May 2013, 22:55:09 UTC - in response to Message 1373158. If it happens when the transition is finished, it will be a comment! But there should have been an announcement, that's before something has begun! Message 1373189 - Posted: 29 May 2013, 23:31:56 UTC - in response to Message 1373186. Hopefully they are now looking at why the MB splitters are not getting up to speed. I haven't converted over to V7 yet. Still running the same x41zc with Cuda 5.0. Had some computer problems so I'm concentrating on that issue first. Just awhile ago, I received a batch (maybe a dozen or so) VLAR tasks as GPU tasks. I was amazed to see this to say the least. This problem was fixed ages ago. I Rescheded them to the CPU and all was well. A little while later, I received another VLAR as a GPU task and aborted it. Question, has anyone else seen this behavior? Wonder if this has anything to do with the V7 apps now available? I know that makes no sense, but it's just a suspicion. Message 1373212 - Posted: 30 May 2013, 1:10:04 UTC - in response to Message 1373208. This was a test we were working on over at beta and it seems to have made the transition over here as well. The CUDA app should be able to handle the work just fine now. Message 1373215 - Posted: 30 May 2013, 1:17:07 UTC - in response to Message 1373208. Certainly please advise if you do get some issues with these at default settings. Please let some run during the APR dialin period, so that credit rates can *hopefully* dialin correctly. VLAR could be made as runtime outliers, or other adjustments made server side if things don't balance out by themselves. OK, thanks guys. I'll keep an eye on it.